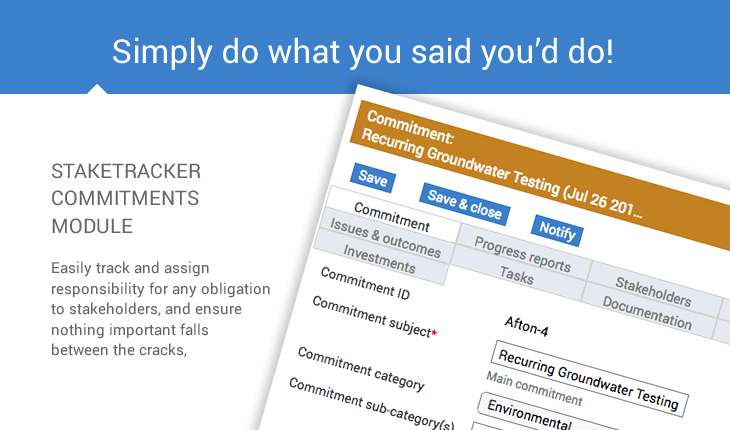 The StakeTracker Commitments Module lets you easily track and assign responsibility for any obligation to stakeholders, from simple verbal promises and expectations to more formal permit conditions and agreements, to ensure that nothing important falls between the cracks. After meaningful engagement, the essence of good stakeholder relations, is to simply do what you said you’d do, and these responsibilities are easily managed with the StakeTracker Commitments Module. StakeTracker is a dedicated stakeholder management solutions that helps organizations stay on track with their commitments by centrally managing all communications regarding the impact their initiatives have on the communities in which they operate. In addition to easing the burden and risk associated with manual tracking commitments, StakeTracker records stakeholder issues, interests, and concerns as well as manages the assignment of tasks and generation of project reports that help organizations demonstrate commitments have been met. StakeTracker also ensures that all communications related to a commitment are archived. As a result, there is a consistent, historic digital record of what has transpired regarding promises to stakeholders even if team members or stakeholder representatives change over time. All commitments are assigned to specific team members, with due dates, reminders and escalations if they are not met. All commitments can have recurrences set so that each completed commitment generates the next one. Commitments can be set to perpetual status, which means they don’t have a specific due date, but are always to be adhered to. Users can link commitment to Events and Communications in order to track the process and dialogue that occurred to honour the commitment.